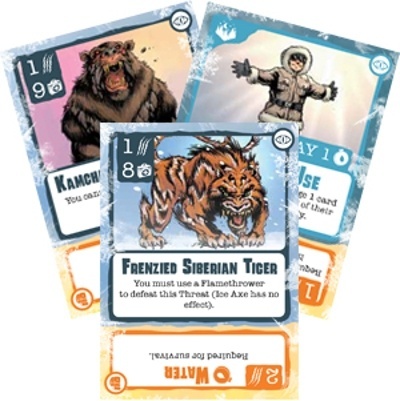 In Outpost: Siberia, players work together to try to survive a long winter in Siberia. They are all workers in a science outpost, and somehow they missed the evacuation notice before the “storm of the century”. The game itself is contained in a single deck of cards – split up into four different types: characters, threats, good events and bad events. Depending on how the cards are rotated, they can either be a regular card or they can be Equipment. Each player is given a Character card (out of 6 possible). Each has a special ability printed on the card, and a life counter is placed on the highest space of the life counter. 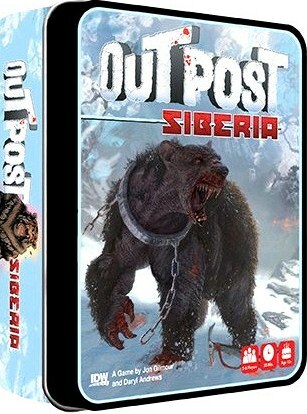 Outpost: Siberia is a cooperative game, if any character ever has a health of zero, that character dies AND the whole group loses! The group will win if the whole group can survive to the end of the Expedition deck. To set up, the good and bad event decks are shuffled separately and an Event Deck of 12 cards is constructed with varying number of cards from each based on the chosen difficulty level of the game. These 12 Event cards are then shuffled into the Threat cards to make up the Expedition deck. The rest of the Event decks are shuffled to make up the Outpost deck. 1] Draw Outpost cards – Draw the top 2 cards from the Outpost Deck – add one of these cards to your hand and place the other face up to the table in the Supply. Cards in the Supply can only be used as Equipment – that is only for the yellow highlighted area. 2] Attack Threats – You may now choose to play any number of cards from your hands to attack any Threat cards in play. You will use the yellow side here, specifically paying attention to the attack value in the upper left corner of the yellow section. Place the played cards underneath the Threat card so that you can see the total value of cards played against it. 3] Use Equipment – You may now use any Equipment cards from the Supply. If you use them, they are placed in the Discard pile. There are three main types of Equipment: Flare (ignore the effects of a Threat for the rest of the round), First Aid Kit (choose any player to gain a health point), Weapon (choose a Threat that has enough value of attack cards played against it and destroy it). 4] Endure Expedition Card – Draw the top card of the Expedition Deck. If it is a Event, you must discard the food or water listed on it or choose a character to lose a Health point. Then, follow the instructions printed on the Event card and discard it. If it is a Threat card, it goes face up on the table and is now in play. Any non-exhausted player must take the threat’s attack value as damage against his health. 5] Exhaust your character card – turn your character card sideways to show that it has taken its action this turn. If a threat card was drawn, the player who took the damage goes next. If not, the current active player can choose who goes next. This continues until all players have taken a turn. Before the next turn starts though, all of the remaining Threats on the table take their end-of-round action, if they have any. The game is won if the players are able to draw the last card in the Expedition deck (30 total) and survive with all players remaining alive. The players lose immediately if any player’s health is reduced to zero. The idea of the cards with multiple functions is neat – it allows the game to be contained in a single deck while giving more than just 54 options/actions. The depth of the game seems to be good for the size of the components… However, I can’t really tell you how that works out because I’ve yet to make it to the end of the deck! Even on the easiest difficulty level, we found this one a constant struggle to survive. Even the good events have a cost associated with them, and due to the timing that the cards can come out, you might not even really get a good thing in return. For instance, if you draw the “Emergency Surgery” card early on – before anyone has lost any HP – you not only pay a food for this good event, you lose the chance to heal up on a super-valuable victory point. This good event has essentially turned into a bad event as you can’t get to use that heal action later in the game. It has gone to waste. Health is pretty important in the game – like many cooperative games, if any of the party dies, the game is lost. Not sure why all of these hardened groups of survivors simply lose the will to fight on when a single member dies… you’d think that they might just use the body for extra food and keep fighting on! The weird thing about this game is that we found it pretty hard at 5p on our first game. We chalked it up to being inexperienced with the cards and not knowing what to expect. Later, I tried the game in 3p, and I read the rules multiple times to find the setup for a lower player count, and as far as I can tell – there IS NO SCALING. This is totally weird. The number of monsters to kill are the same, you just have fewer total health points to accomplish the same goals. Needless to say, we got slaughtered in that one. At a minimum, each threat card costs someone a health point – and that means a total of 18 in the game. If you play with all 6 characters, you start with a total of 21 life points amongst the team. When you play with 3 characters, you’ll have at most 12 points but you might only have 9! The number of healing cards doesn’t increase nor does the number of threat cards decrease. I’m hoping that I’ve missed something in the rules – but I’ve looked around online, and I have found a number of corroborating session reports that all agree that the rules do not include scaling for player number. This is an astonishing lack of flexibility (or possibly rules proofing) – as far as I can tell, the game is essentially unwinnable with any number of players less than 4, and you’d have to have nearly an optimal run through the deck with optimal re-shuffles to win with 4. But, I haven’t tried it – that’s just mental calculation based on the cards in the deck. We have been so frustrated by the initial plays through to want to try again. We haven’t been able to get all the way to the end, and due to the lack of scaling rules, I wouldn’t want to play this with less than 6. That’s not a situation that comes up much in my gaming life right now, and even if it did, I wouldn’t want to be the one to suggest this one to five other gamers. I haven’t had fun with it as it doesn’t feel like we ever have had a chance to win. It’s like being a Cleveland Browns fan.